This blog follows up on three earlier posts about detecting preservation risks in PDF files. In part 1 I explored to what extent the Preflight component of the Apache PDFBox library can be used to detect specific preservation risks in PDF documents. This was followed up by some work during the SPRUCE Hackathon in Leeds, which is covered by this blog post by Peter Cliff. Then last summer I did a series of additional tests using files from the Adobe Acrobat Engineering website. The main outcome of this more recent work was that, although showing great promise, Preflight was struggling with many more complex PDFs. Fast-forward another six months and, thanks to the excellent response of the Preflight developers to our bug reports, the most serious of these problems are now largely solved1. So, time to move on to the next step! Ultimately, the aim of this work is to be able to profile large PDF collections for specific preservation risks, or to verify that a PDF conforms to an institute-specific policy before ingest. To get a better idea of how that might work in practice, I decided to do some tests with the Govdocs Selected dataset, which is a subset of the Govdocs1 corpus. As a first step I ran the latest version of Preflight on every PDF in the corpus (about 15 thousand)2. As I was curious about the most common validation errors (or, more correctly, violations of the PDF/A-1b profile), I ran a little post-processing script on the output files to calculate error occurrences. The following table lists the results. For each Preflight error (which is represented as an error code), the table shows the number of PDFs for which the error was reported (expressed as a percentage)3. Some errors are really common; for instance, error 2.4.3 is reported for nearly 80% of all PDFs in the corpus! Errors related to color spaces, metadata and fonts are particularly common. File structure errors (1.x range) are reported quite a lot as well. Although I haven't looked at this in any detail, I expect that for some files these errors truly reflect a deviation from the PDF/A-1 profile, whereas in other cases these files may simply not be valid PDF (which would be more serious). About 6.5% of all analysed files raised an exception in Preflight, which could either mean that something is seriously wrong with them, or alternatively it may point to bugs in Preflight. Although it's easy to get overwhelmed by the Preflight output above, we should keep in mind here that the ultimate aim of this work is not to validate against PDF/A-1, but to assess arbitrary PDFs against a pre-defined technical profile. This profile may reflect an institution's low-level preservation policies on the requirements a PDF must meet to be deemed suitable for long-term preservation. In SCAPE such low-level policies are called control policies, and you can find more information on them here and here. Preflight's output contains all the information that is needed to establish whether each objective is met (except objective 6, which would need a full-fledged PDF validator). By translating the above objectives into a set of Schematron rules, it is pretty straightforward to assess each PDF in our dataset against the control policy. If that sounds familiar: this is the same approach that we used earlier for assessing JP2 images against a technical profile. A schema that represents our control policy can be found here. Note that this is only a first attempt, and it may well need some further fine-tuning (more about that later). Here each bar represents the occurrences of individual failed tests in our schema. 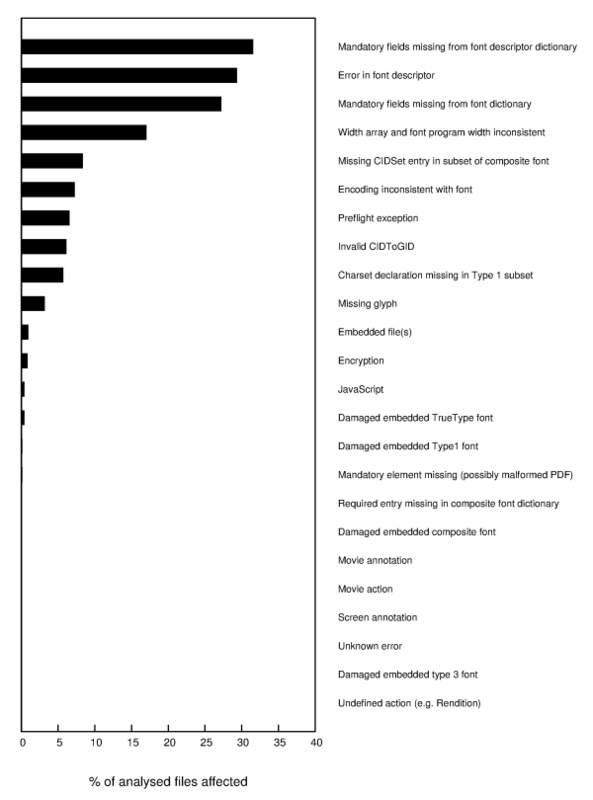 What is clear here is that the majority of failed tests is font-related. The Schematron rules that I used for the assessment currently includes all font errors that are reported by Preflight. Perhaps this is too strict on objective 2 ("Fonts must be embedded and complete"). A particular difficulty here is that it is often hard to envisage the impact of particular font errors on the rendering process. On the other hand, the results are consistent with the outcome of a 2013 survey by the PDF Association, which showed that its members see fonts as the most challenging aspect of PDF, both for processing and writing (source: this presentation by Duff Johnson). So, the assessment results may simply reflect that font problems are widespread4. One should also keep in mind that Govdocs selected was created by selecting on unique combinations of file properties from files in Govdocs1. As a result, one would expect this dataset to be more heterogeneous than most 'typical' PDF collections, and this would also influence the results. For instance, the Creating Program selection property could result in a relative over-representation of files that were produced by some crappy creation tool. Whether this is really the case could be easily tested by repeating this analysis for other collections. These preliminary results show that policy-based assessment of PDF is possible using a combination of Apache Preflight and Schematron. However, dealing with font issues appears to be a particular challenge. Also, the lack of reliable tools to test for overall conformity to PDF (e.g. ISO 32000) is still a major limitation. Another limitation of this analysis is the lack of ground truth, which makes it difficult to assess the accuracy of the results. For those who want to have a go at the analyses that I've presented here, I've created a simple demo script here. The raw output data of the Govdocs selected corpus can be found here. This includes all Preflight files, the Schematron output and the error counts. A download link for the Govdocs selected corpus can be found at the bottom of this blog post. Apache Preflight developers Eric Leleu, Andreas Lehmkühler and Guillaume Bailleul are thanked for their support and prompt response to my questions and bug reports.